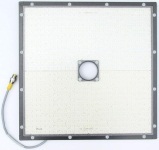 This panel projects a diffuse light appropriate for imaging many reflective or uneven surfaces. It offers most of the advantages of a dome light, but produces brighter light in a compact, flat panel. It does not, however, work well when imaging mirror-like surfaces. This panel can be connected directly to 24 volt DC power. It has a strobe input and a quick-disconnect connector. A 4 meter cable is included. Please contact us if you’re interested in a custom size, a different diffuser, a longer cable, or a high-flex cable. Window: Shower Glass Diffuser Window options include thin film diffuser, white diffuser, white semi-opaque diffuser, and linear polarizer.